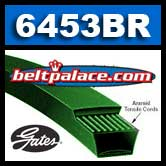 Gates BladeRunner 6453BR Outdoor Power Replacement Belt for MTD, Murray, AYP, Bob-Cat, Homelite, Simplicity, Snapper, Toro, and Exmark among other OEM brands. Spec: 30.75" OC, 0.500" Top Width. Premium Gates 6453BR Kevlar/Aramid Construction. 4L305 FHP V-Belt. Consumer Brand. 4L305 FHP V-Belt. 1/2” W x 30.5" Overall Length. Consumer Brand.